UK 8 / US 9 1 Left! UK20 / 16 USA 1 Left! UK22 / 18 USA 1 Left! 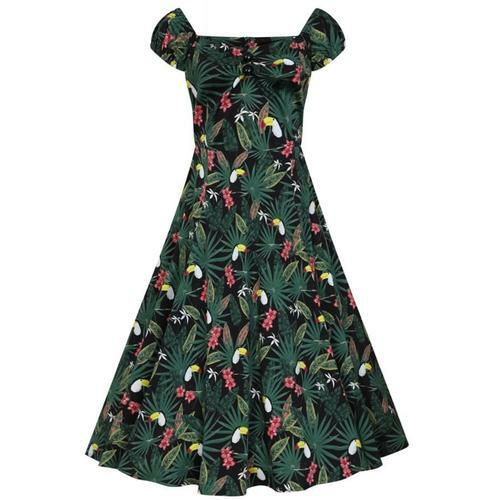 Get ready for the beach with this gorgeous Mahina vintage palm sarong dress from Collectif. Mahina has an all-over contrasting retro palm tree print on a 50s pencil style dress with a wrap around front. The sweetheart style neckline adds an elegant vintage touch and the straps can be worn two different ways, crisscrossed at the front or over the shoulders, or not at all depending on your style. Mahina is also elasticated in the back for the perfect fit. Mahina vintage palm print sarong dress in black from Collectif. Detachable shoulder straps - can be worn crisscrossed, over the shoulder or not at all.